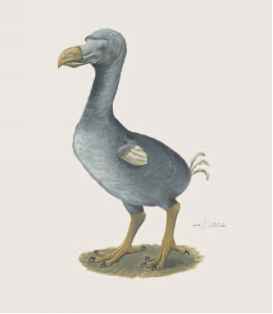 Dodos were described as eating fruit primarily. The Rodrigues solitaire was described as eating seeds, fruit, and leaves. Both dodos and Rodrigues solitaires had an annual fat cycle during which they were fat for several months and thin the rest of the year. In the Rodrigues solitaire, individuals were fat from March to September and then thin. It was reported by one observer that two Rodrigues solitaire chicks had a fat layer 1 inch (2.5 centimeters) thick over the entire body. This fat cycle is common in many bird species of the Mascarene islands.